No, it's not the real Cuban revolutionary leader Fidel Castro on that balcony having a speech to his followers in Buenos Aires. 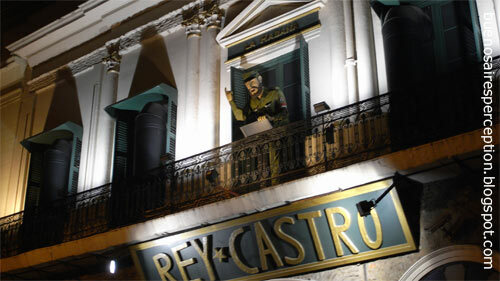 It is just the promotional mascot of the Cuban restaurant called "Rey Castro". If you like Cuban and Latin food, go check it out. It's located at 342 Peru Street. There are also performances and entertainment in the evenings. I would like checking it out...love Cuban food.